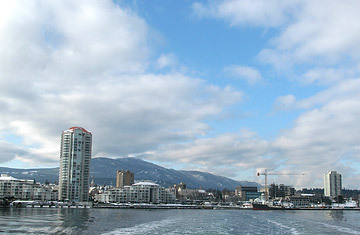 The skyline in Nanaimo, British Columbia on Vancouver Island. When they hear the telltale sirens of a fire truck bursting out of the station in Nanaimo, the locals don't need to look out of the window or tune in to newscasts to find out where the action is. Instead, they can simply log on to Google Maps or Google Earth and track the firefighters in real time as they tear down the streets of this Vancouver Island port community. The Google-enabling of Nanaimo's fire service, launched just weeks ago, is the latest venture in a British Columbia town that has been dubbed the capital of Google Earth. "With Nanaimo, they have mapped nearly every conceivable thing using Google Earth and Google Maps," Michael Jones, Google Earth's chief technology officer, said last August at a conference in Vancouver. "Their citizens have more information about their city than the people of San Francisco." Beating San Francisco in the e-stakes is a big deal for an old coal mining city of only around 78,000 people, nestled about an hour north of Victoria. What Nanaimo lacks for in size, it has tried to make up in sheer volume of raw electronic data. The city's planning department has, over the past five years, steadily fed Google a wealth of information about its buildings, property lines, utilities and streets. The result is earth.nanaimo.ca, a clearinghouse of city data viewed through the robust and freely available Google Earth 3D mapping program. The site sorts and maps every business, from restaurants to car dealers, while a click of the mouse brings up the lot size for every property in the city, including the building permit number and zoning history. Homeowners can use the facility to find out specific information about their garbage collection schedule, while the city's 150-year-old downtown core is rendered in 3D and dotted with 360-degree panoramas. "We actually gave them our base map, and we were probably the first municipality to give them that data," says Per Kristensen, Nanaimo's chief technology officer. "Over time, that has just continued to increase." Nanaimo is betting that embracing Google, the ubiquitous search engine that has become the starting point for most internet searches, will be good for tourism. "The real benefit is on the economic development and economic activity side," said Kristensen "The more information people have, the more they see about Nanaimo." The tourism potential has caught the eye of the British Columbia government, which is pushing hard to draw in visitors in advance of hosting the 2010 Winter Olympics. Its biggest city, Vancouver, has now linked its transit system into Google Maps. And the regional government is set to become the first Canadian province to hand Google its public database, giving the technology company access to a list of parks, forestry titles, bridges, power lines, topography and mineral, coal and gas reserves for more than 94% of British Columbia's 357,000 square miles of rocky mountains and picturesque coast. Agriculture Minister Pat Bell called the Google partnership a "very big win-win for everyone." But what does all this internet mapping and graphing mean for the people who actually live in this Google-ized community? In theory, it could improve their lives by providing more information about the urban environment in which they live. The Google fire service allows people to avoid accident sites by tuning electronic devices to automatic updates from the city's RSS news feed, says fire captain Dean Ford. Eventually, Nanaimo plans to equip its grass-cutting machines with GPS devices, so residents piqued by the apparent shabbiness of a particular park or grass verge can use Google to find out when last it was groomed by the city's gardening staff. And the city's cemeteries will soon be mapped to allow internet users to find out who is buried in each plot, says Kristensen. A new multimillion-dollar conference center, opening in June, will have 72 wireless access points to allow out-of-towners to use their laptops to navigate the Google Earth version of the city. Good for tourists, perhaps, and a real live test-bed for the company's ambitions to Google-ize far larger metropolises. But the reality in Nanaimo is that many locals are entirely unaware of the new electronic pathways for navigating their city. "I think it's pretty cool we're the Google Earth capital of the world," said Jakob Brzovic, 25, who works in a local electronics retail store. "I just wish somebody would have told me." "For people who live out of town, it would be a great resource and tool," he added. "But, to be fair, if you've been living here your whole life like I have, you don't need to use Google Maps. You just use your brain."